Other Tampa Bay area communities that made the Top 10 were St. Petersburg, Spring Hill, Riverview, Town ‘N’ Country and Tampa. LARGO – This city was ranked as No. 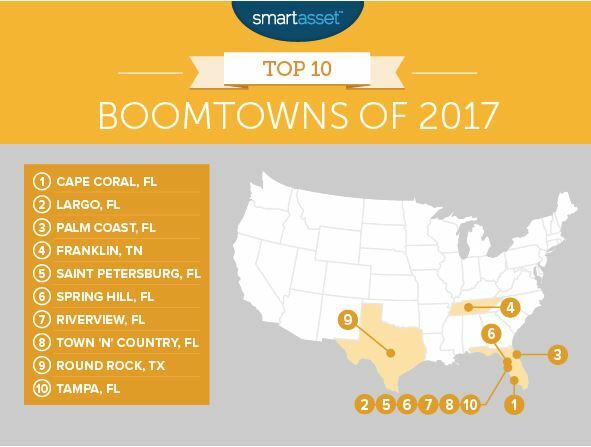 2 in the list of Top 10 Boomtowns of 2017 by SmartAsset.com, a personal finance and technology website that uses financial modeling to help consumers obtain advice on major financial decisions. A “boomtown” is a community that undergoes sudden and rapid population and economic growth due to prosperity. Now in it’s fourth year, the SmartAsset study analyzed data from 581 cities across five categories: unemployment data, unemployment rate changes, housing unit changes, population growth and Gross Domestic Product growth. Florida dominates the study with eight cities listed in the top 10. The Tampa Bay area represents the majority of those: St Petersburg (No. 5), Spring Hill (No. 6), Riverview (No. 7), Town ‘N’ Country (No. 8) and Tampa (No. 10). Largo alone saw net migration gains of 1.9 percent of the city’s overall population. The net migration rate is the number of people who have immigrated to a particular city minus the number of people who have emigrated from that city between July 1, 2015 and July 1, 2016, as a percentage of the city’s total population. Data comes from the 2016 American Community Survey. The study also looked at the housing growth rate in each boomtown community. Largo came in strong with housing growth rate at 7 percent between 2015 and 2016 based on the 2016 1-Year American Community Survey. With an unemployment rate of only 3.1 percent and a yearly GDP growth rate of 4.2 percent, ranging from 2011 to 2016, Largo scored high with 97 percent on SmartAsset’s Boomtown Index. “This study verifies what we’ve known that was taking place in Largo. We’re business-friendly, we have great neighborhoods and our amenities are the best in the market. Naturally, people just want to be a part of that,” Largo Mayor Woody Brown said. Chart of Boomtowns courtesy of SmartAsset.com. Other Tampa Bay area communities that made the Top 10 were St. Petersburg, Spring Hill, Riverview and Tampa.